2003 Denis Halliday, former UN Humanitarian Co-ordinator in Iraq. 2004 Helen Steven and Ellen Moxley, for their work in campaigning against weapons of mass destruction and the arms industry over the past 30 years. 2005 Clive Stafford Smith, human rights lawyer, for his work representing Guantanamo detainees and campaigning against extraordinary rendition. 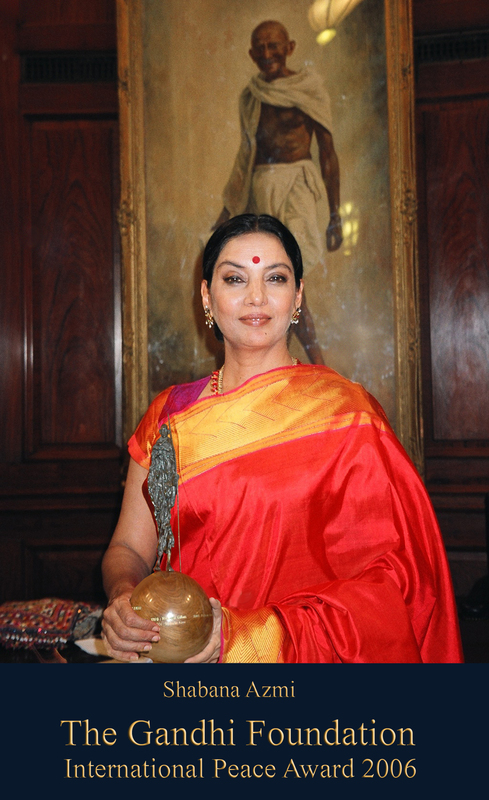 2006 Shabana Azmi, Indian film actress, social activist and United Nations Population Fund Goodwill Ambassador. The award was for Ms. Azmi’s tireless work over many decades helping the slum dwellers of Mumbai through the organisation Nivara Haak, her activism in championing women’s rights and her passionate opposition to religious fundamentalism. 2007 Media Lens founders David Edwards and David Cromwell. Media Lens is an online, UK-based media watch project, set up in 2001, providing detailed and documented criticism of bias and omissions in the British media. 2008 Rev. Harold Good OBE & Father Alex Reid CSSR, for their work in Northern Ireland as independent witnesses to the disarmament conducted under General John de Chastelain. 2009 The Children’s Legal Centre, for its work in representing young and vulnerable children, especially girls, and in helping to change the legal structures relating to children. 2010 The Parents Circle Family Forum. The PCFF is a grassroots organization of bereaved Palestinians and Israelis, families who have lost loved ones to violence in the conflict. It promotes reconciliation as an alternative to hatred and revenge. Each year they arrange hundreds of dialogue encounters between Israelis and Palestinians, to promote mutual understanding. 2011 Dr Binayak Sen and Bulu Imam ‘for their humanitarian work’ amongst the tribal peoples of India, the Adivasis. 2012 The St John of Jerusalem Eye Hospital Group for their humanitarian work in very difficult circumstances and for bringing people together through that work for the betterment of all. 2013 Jeremy Corbyn in recognition of his consistent efforts over a 30 year Parliamentary career to uphold the Gandhian values of social justice and non‐violence. 2014 Godric Bader and the Scott Bader Commonwealth for the alternative business model created by him and his family. 2004 Helen Steven, founder of The Scottish Centre for Nonviolence, on “Our World at the Crossroads: Nonviolence or Nonexistence”. 2014 In association with the Inner Temple – Hon Dr Navichandra Ramgoolam – Prime Minister of Mauritius on The Rule of Law and Nation Building. 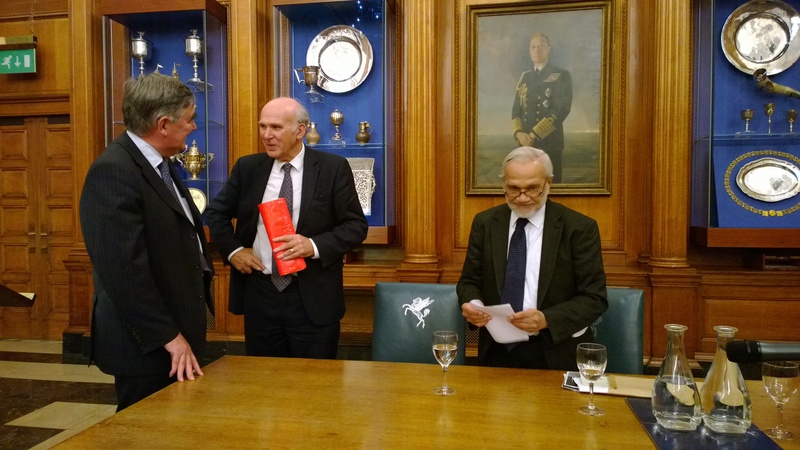 Rt Hon Vince Cable MP and Lord Bhikhu Parekh at the 2013 Gandhi Foundation Annual lecture. Every year, around the anniversary of his assassination (30th January 1948), there is a Multi Faith Celebration of Gandhi’s life. It is normally held in London, and brings together people of different faiths such as Buddhist, Christian, Hindu, Jain, Jewish, Muslim and Sikh. Our aim is to remember Gandhi, and to share words, music and dance from our religious traditions. Every year in July there is a Summer Gathering in the UK, where people of all ages live together for a week in the countryside, sharing the necessary tasks of cleaning, cooking, and washing-up, and attending daily workshops to explore different aspects of the chosen theme for the year. A variety of crafts are taught, and our usual lifestyles and attitudes are challenged. Many find this an enlightening experience and return year after year. Some of the participants come from India and other countries. You can read an account of the Summer Gathering 2012 here. 2011. Gandhi in Noakhali – Film screening. Testimonials from Gandhi’s visit – Shaheen Westcombe MBE talks about her father’s archive. And a mid-season exhibition by resident artist Saif Osmani who examines the spaces inhabited by Gandhi. 2012. Photographer Brijesh Patel delivered a post AGM presentation on his “Salt: Land & People” project inspired by Gandhi’s Satyagraha campaign. 2013. Ruhul Abdin and colleagues from Paraa gave a lecture, slideshow and video presentation about their work to establish a community learning and resource centre in the Mohammadpur Geneva Camp in Dhaka, Bangladesh. This project has been helped by the Gandhi Foundation. 2014. Mirabai Swingler who is a mental health chaplain and trained teacher, psychotherapist and spiritual director gave a talk entitled From Breakdown to Breakthrough; Gandhi and Mental Health. This was followed by a reception and an opportunity to visit where Gandhi stayed at Kingsley Hall in 1931. 2015. A screening and discussion of Cotton for My Shroud – A film about the plight of cotton farmers in India and the culpability of the multinational Monsanto and the Indian Government. In addition to the regular events we have held a number of seminars, produced a small number of publications, held a vigil against nuclear tests by India and Pakistan, produced a video on cooperative games, given talks and workshops, erected stalls at other organisations’ events, taken the Gandhi banner on peace marches; helped others in preparing two exhibitions on “Gandhi’s visit to east London” and “Gandhi and Ruskin”. In the past we were given financial and other support to five villages in Orissa, and are at present planning a project on conflict resolution for schools in the area of London close to Kingsley Hall community centre where the foundation has an office. In order to assist educators, The Gandhi Foundation has produced a presentation ‘Gandhi – A Life in Pictures’, designed to be used at secondary / high school level, and also suitable for adult audiences. It is free to download, but please support the development of resources such as these by making a secure donation via Paypal. A free educational resource pack on Gandhi, designed for school teachers (UK KS3&4), is available in the form of an Adobe PDF file by emailing: farmington@hmc.ox.ac.uk and quoting ref. TT186. Each module suggests relevant clips from the movie Gandhi by Richard Attenborough, and then presents a series of exercises for groups and the whole class. The Gandhi Speakers Network provides a list of Speakers available to address schools and community groups around the country. The Gandhi Foundation has been appointed as UK touring partner by the British Library for its Gandhi Travelling Exhibition. 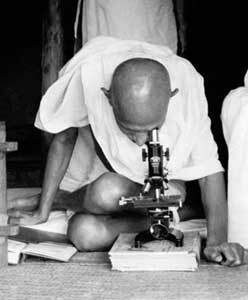 The exhibition comprises six roll-up panels, printed with photographs depicting events in the life of Gandhi. Each panel is 220 cm high and 86 cm wide when erected. If your venue is interested in hosting the exhibition, please email contact@gandhifoundation.org with your requested dates. There is no charge for the exhibition itself, but venues are required to pay transportation costs and to provide insurance cover. In memory of Surur Hoda, the Foundation is putting together a permanent photographic exhibition on Gandhi, based at Kingsley Hall. It is designed as a resource for local school children in the East End of London, and is being developed in partnership with GandhiServe Foundation, Berlin, which has the most extensive photo archive on Mahatma Gandhi and India’s independence movement. Children visiting Kingsley Hall will see view the exhibition and visit Gandhi’s cell upstairs. There will also be artifacts, such as portable spinning wheels for them to try. “Access to safe water has become our leading priority, and of course through water issues of sanitation, nutrition and health are also addressed; the role and empowerment of women through income- generation training, self-help groups and microcredit is integral with these other issues”. The Sacred New Era (SNE) School is an attempt to address the issue of living in the modern world without abandoning traditional culture. It uses a Montessori approach to encourage children from an early age to think for themselves and become aware. This school is different from general Ladakhi Schools and is growing because parents are realising its beneficial qualities. 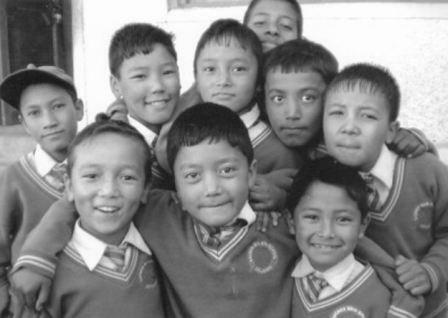 It offers a unique education and is an example of diverse communities within Ladakh working together. There are at present about 160 children aged 3-15 years attending. The majority are from Buddhist families with a quarter Muslim and a few from Hindu and Sikh background. The school has as its honorary Director, Shabir Banday, who is a Ladakhi working in the UK, who frequently visits the school. Denise Moll, who was formerly Secretary of the Gandhi Foundation, is the Secretary of the SNE. The GF has donated to the school and funds are raised in the UK for school equipment and sponsorship is sought. To find out how you can help the SNE contact Denise Moll, 21 Fleetwood Court, Madeira Road, West Byfleet, Surrey KT14 6BE. The Gandhi Foundation is pleased to support the Hakulala Project which was started and is being run by a young Gandhi Foundation friend. The project is based in Ghana and aims to bring education to village children. They believe the most effective method of offering help in developing countries, such as Ghana, is to teach it’s people how to help themselves and make any change self-sustaining. Surur built a close relationship between Kingsley Hall and the Gandhi Foundation. He was also a lover of gardens and the outdoors. Surur’s widow Elisabeth thought that it would therefore be appropriate to dedicate a bench in the Kingsley Hall garden to his memory. 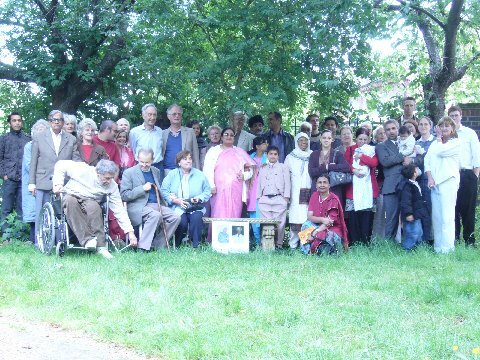 Gathering at Kingsley Hall on 19 May 2007 to unveil a memorial bench to Surur Hoda, first Secretary General of the Gandhi Foundation. A framed photo of Surur with an inscription was placed in the Gandhi Foundation office at Kingsley Hall and the bench placed in the garden at the gathering of GF Friends on 19 May 2007.